“Then Aslan isn’t safe?” asked Lucy. 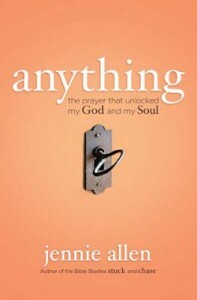 That prayer, and God’s response to it is the life-changing challenge of Jennie Allen’s new book “Anything: the prayer that unlocked my God and my Soul.” (Thomas Nelson, Inc., 2011). The Jesus of the New Testament made people uncomfortable, he shook up the status quo, he asked his disciples to set aside everything that competed with him. And in response to his challenge in their lives, the book of Acts shows how those ordinary Galileans changed history. But a case can be made that we have made the Jesus of American Christianity into a soft-spoken, smiling Mr. Rogers, and our churches into places where we can all relax in our sweaters and slippers until heaven arrives. Jennie Allen’s dreams included all the normal Hallmark card sweetness of a nice home, a loving husband, beautiful children, pleasant neighbors, and a faith that was challenging without being rude. But something a professor had said to her years earlier kept coming back to her: God becomes most real when we risk placing our lives and our future into his unseen hands and wait for him to come through. If C.S. Lewis is right and God isn’t safe, we should be surprised that our faith has led us to settle down into a quiet cul-de-sac where we can watch eternity go by on our wide-screen TVs. And if he is also right that God is good, we can trust him, even when he leads us far out of our comfort zones. Jennie Allen’s “Anything” is a challenging and engaging journal of the faith journey God took her on as she asked the questions we all ask, “Who is God and what does he want from me?” It is written in the intimate, conversational style of a friend who opens her heart across the table in your local coffee shop, but it’s one of those conversations where you walk away knowing that the Spirit has just challenged you to re-examine your faith, your priorities, and every assumption you have made about God’s desires for your life. Joy comes from giving yourself entirely and unreservedly to God. Like ripping a Band-Aid off, giving in, yielding everything, and dying to this life and all we think we want in it — something about that sets you free. Everything I was worried about didn’t seem so important. Everything I was afraid of didn’t seem that scary. Everything I wanted before seemed trite. Everything I doubted about God seemed foolish. Jesus says the way we glorify God, the way we step into his story, is by accomplishing the work God gives us to do. Jesus glorified his father on earth by doing that very thing. We play our part in his story, and the beauty is, it was what we were made for. I’m going to have to get that book. Thanks for the heads up, Charlie. That’s a service to all of us readers. I can recommend another one — Andy Stanley’s “Fields of Gold.” Andy talks about one slice of what Jennie is talking about — the financial part of your life. He recommends making God your financial partner, which means that God gets a say in every financial decision you make. He claims, and I believe he is right, that you will be able to do more with your money than you had thought possible and you also will have no more financial worries. (You may not have much money in the bank or that new motorcycle, either.) It’s a short book and an easy read. I recommended it to my Sunday School class, giving fair warning that it might well upset their whole life. I don’t think anyone took up my recommendation. They probably would be equally afraid of “Anything.” It’s great to have people like Jennie and Andy around, who know how to tell us what we have known all along but have always taken a discount on. Odd, isn’t it? We claim to be able to trust God for our eternity but are hesitant to trust him for right now. But now I’m afraid that I’m just repeating your own words, Charlie. Consider it a form of flattery.